My muse (wife-Susan) tells me it is time for a break from the aviary portraits and to give you something else for your eye to ponder. 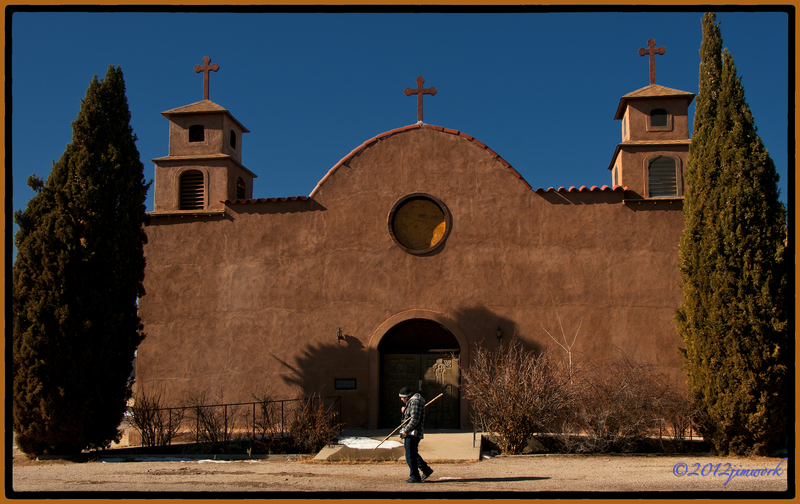 This photograph was made in San Antonio NM early in the am as we were in route to Bosque Del Apache refuge. Right before we came to the San Antonio Catholic Church, we passed this gentleman walking towards the church. I have photographed this church many times over the years, but the images have always well, they have just been boring. I thought getting a human element might help complete the scene. I got out of my car and started making some photos of the church waiting on the man. He saw me taking photos and politely stopped as he came into frame. I waved at him to come on through. He replied “Si, Buenos dias” and continued on his journey. He was leaning heavily on his home made walking staff, but when he came even with the front door of the chapel, he tucked his staff and slowed enough to say a short prayer and blessed himself.